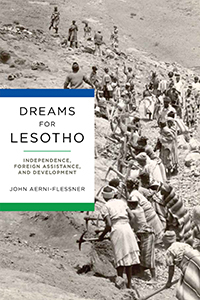 In Dreams for Lesotho: Independence, Foreign Assistance, and Development (University of Notre Dame Press, 2018), John Aerni-Flessner ’01 studies the post-independence emergence of Lesotho as an example of the uneven ways in which people experienced development at the end of colonialism in Africa. The book posits that development became the language through which Basotho (the people of Lesotho) conceived of the dream of independence, both before and after the 1966 transfer of power. Aerni-Flessner went to Lesotho in 2002 as part of the third cohort of Grinnell Corps Lesotho fellows. With George Drake ’56 as his adviser, Aerni-Flessner lived and taught in Lesotho for a year and now makes it his scholarly career as a historian.